This is an uncommon c.1680 map of China by Philip Cluver. The map covers China from Laos east as far as Japan and from the Great Wall south as far as Hainan and northern Philippines. Taiwan is also noted. Though based on an earlier map by Joan Blaeu with the same title, this map corrects some of the errors in Blaeu's map. Unlike the earlier map by Joan Blaeu, on which this map is based on, this map no longer depicts Korea as a peninsula. Several cities and provinces in China are named. The Great Wall is depicted beautifully, and some cities in Korea and Japan are also noted. The most notable feature of this map is the imaginary Lake 'Kia Lacus' near the left border, which is apparently the source of five rivers flowing south. 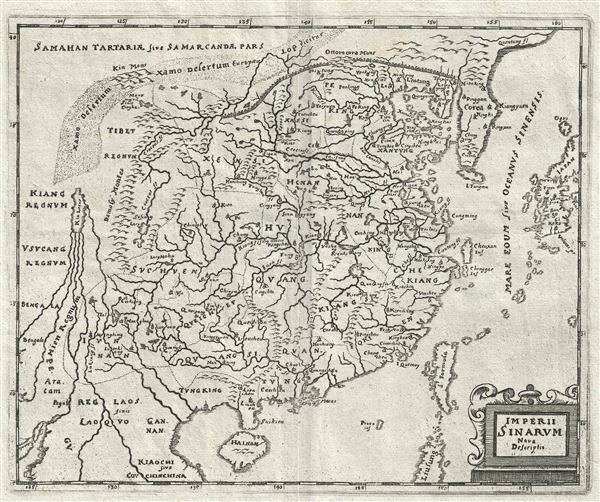 This map was issued by Philipp Cluver in the 1661 edition of Introductionis in Universam Geographiam tam veterem quam novam Libri.